Classic style large wooden planters that are manufactured in our workshops from British grown western red cedar. The corner posts are 100mm square with 70mm square cross beams.The sides are infilled with 25mm thick planking. The bottom is slatted to allow drainage and the whole planter is hand rubbed to finish. 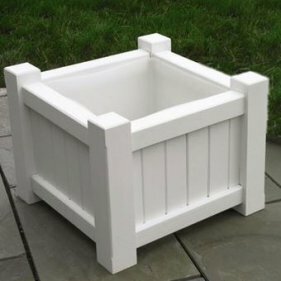 The internal walls of these planters are now painted with a waterproof paint sealant. Use Planters to brighten a dull spot. The beauty of a planter display is its portability, which means it can placed anywhere in a garden to add a splash of colour and interest. Even a strategically placed empty planter can have an impact. 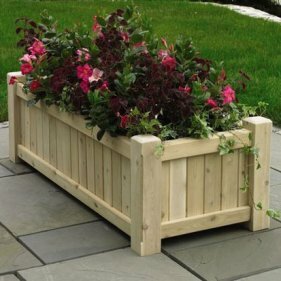 One of the main advantages of planter gardening is its great flexibility. You can move plants to centre stage when they are in their prime and out of the spotlight when they fade, or you may decide to discard and replace them as you 'would a vase of flowers. enjoy maximum benefit from the blooms. This idea not only works well for spring bulbs such as daffodils and tulips, but also for beautiful summer lilies. You can also put a flourishing planter into a herbaceous border to hide the gap left when a plant dies back or fails. Position a planter in front of a flowering shrub once its own flush is over. A dreary passage along the side of a house can be cheered up with a well-placed planter filled with bright busy lizzies, while boring utilitarian steps are transformed by placing a small planter on each tread. And planters are ideal for front steps, too, particularly for those town houses that do not have much or any soil to plant in, and where there is limited space between the house and the pavement.